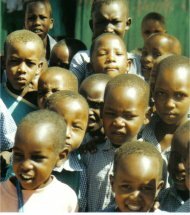 The situation for the children of Kenya is of particular importance, because they make up an unusually large portion of the population. Forty percent of Kenya's population is aged under 14 years, while most Western or developed countries have less than 20% of their population in that age group. The percentages are skewed somewhat by the low life expectancy in Kenya (due largely to the spread of HIV and AIDS), which leaves the country with a very small population of seniors. This also means many of Kenya's children are orphans. The Kenyan education system is similar to that in the USA, with 8 years at a primary level, 4 years of secondary education, and then the potential to continue with another 4 years of post-secondary schooling. Though children can (and are meanwhile obliged) to attend primary school at no cost in Kenya, parents are expected to contribute towards the cost of running the school. This has led to a serious deterioration in the education infrastructure and teaching field, since many parents are too poor to pay. 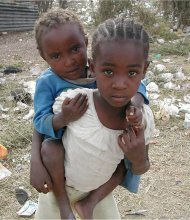 Life can be difficult for children of Kenya due to poverty and unemployment. Families are often forced to take children out of school (even when fees are not the problem) because they are needed to earn money for the family. With jobs scarce and low-paying, every member of the family must work, especially if the parents are unable to find work of their own. For families with their own farms, children may also be pulled from school because they are needed to help tend cattle or crops. With half of all rural Kenyans living in poverty, this is a constant struggle. Children of Kenya who live in the cities aren't always in a better situation compared to rural children. Abandoned or orphaned children are forced to live in the streets, and live a life of hunger, crime and sexual abuse. As modern life changes the lifestyles of most Kenyans, those still living in rural areas often continue to follow the old ways of their tribe, particularly when it comes to coming-of-age rituals. The specific details of the rituals vary from tribe to tribe. One of the most common practices is circumcision for the boys, and in some cases also for the girls. Male circumcision is a fairly minor procedure, which is considered socially acceptable throughout the Western world. On the other hand, the female version is known as "genital mutilation", and is still popular through the country due to age-old traditions. Pressure from many humanitarian groups has increased to end the practice, to save the female children of Kenya the trauma and pain of this rite.